A number of years ago now, because of a job I was already doing, I ended up taking a Master’s degree in Youth and Community Work at DeMontfort University. I was expecting a little theory and a lot of professional development, which I got, in the form of two nationally recognized qualifications on top of the Master’s, which was nice. What I wasn’t expecting was a kind of apprenticeship in anti-oppressive education. I was challenged, hard, by some very radical academics. I have to say it was tough at times, and it probably engineered me out of the job, because my line manager was an old school youth worker who liked to run music projects and take the young people to theme parks, and he really, really wasn’t prepared for assignments on globalisation, body image, and participative democracy in action. But I loved every minute of it. I spent time with the Terrence Higgins Trust youth team, and discussed intersectional politics with Muslim young men’s workers and gained the confidence to jump into running a national community engagement project with the National Trust. And then I became a yoga teacher, and somehow, all those feisty, political issues became quietly taboo. Modern yoga culture has a tendency to respond to politico-structural issues with fuzzy, pink-tinged, life coach answers; which in the case of structural inequality actually increases rather than decreases oppression. So when yoga studios are struggling to survive urban gentrification and they run more and more teacher trainings, leading to more and more yoga teachers struggling to find students, the answers given are all about personal change – from marketing oneself better to setting a clearer intention. Even though the teachers with the most at stake are those already most marginalised. It’s easy to preach non-attachment when your income is already secure. And increasingly, someone within yoga culture will open a debate about how yoga-related industries like clothing manufacturers and shows and retreat centres advertise themselves with an unending parade of glossy, white, thin women with perfect teeth; and what this might mean for our complicity with body-shaming. But the most common response is to shrug and say people should concentrate on their own practice, or the rather odd idea that any way to practice yoga is inherently positive. This is provably wrong, but it doesn’t stop people saying it. Generally, each of us finds within any personal, contemplative practice experiences which confirm our pre-existing political and philosophical positions. And even when revelation comes, the insights from practice have to be both applied to and enacted in the socio-political, inter-personal world to have any effect that we might term as social justice. Otherwise, we’re little different from my stoner ex-housemate who truly believed that the world would be perfect if everyone took the right drugs, because you can’t be mean to people when you’re high. Over the years, I’ve realised that my teaching practice becomes more anti-oppressive, more inclusive, the more I can extricate myself from the culture of bright, positive, Stepford Wives self-promotion and life-coaching that seems to be the norm in modern yoga. I no longer pretend to have all the answers. I no longer pretend to be able to heal every ache and wound. I try and reach out beyond the easy circle of people who look just like me. The very difficult challenge of balancing inclusivity and radical honesty with (modestly) helping to pay the mortgage feels a lot more real, and a lot less distanced from the life my students are living. I am so much more whole, more integrated, since I stopped silencing my very finely tuned capacities for political and critical thought. Discernment after all, is one of those rare practices of yoga philosophy most of us seem to agree on. I’m not sure how it came to its common meaning within yoga of ‘refusing to think about anything bad, ever’. Yoga should support us to be the people we want to be. We need to measure our practice by the real, tangible difference it enables us to make in the world. What can activists find within yoga practice beyond simple health and wellbeing? Is it a respite, or a hope, or a benevolence, or something else or all of these? What is the wellspring that soothes our bruises and lets us go back into the fray? And is the practice changed as a result? 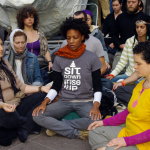 Is what we are doing the same, or different as corporate mindfulness seminars? Is any difference teachable or transmissable? I have some ideas, but I’m still exploring them. And that’s my question as a scholar and academic. My question as a yoga/meditation practitioner is slightly different: what kind of yoga/meditation do we want? Because I’m clear that corporate mindfulness and Lululemon manifestos are just as coherent with the roots of yoga as anything else, but we do get to make a choice, not on what yoga really is, but what yoga we want. We get to say – this might be yoga, but it’s not my yoga. ‘My’ yoga is one that engages with such issues as cultural appropriation, privilege, and social justice. ‘My’ yoga is no longer the kind that leaves me glassy eyed and floating above the world in a bubble of oneness. ‘My’ yoga is one where we actively discuss alternatives to the pyramid scheme that is the studio teacher-training mill, rather than trying to life coach yet more white, middle class, idealistic, newly qualified teachers into building their ‘brand’ and monetising their ‘business’. And if that sounds good to you, maybe together we can wrestle one small, feisty, rebel corner of yoga culture into a more effective support for cultural change – it’s worth a try, isn’t it? Because these healing technologies are awesome – and they can be democratic and cheap, and I’m not ready to cede all of that ground to the juggernaut of neoliberalism just yet. Pingback: Great yoga reads – More Intentional.